Scansonic are Danish and share the same parent company as Raidho, indeed they share the same designer. The M-5 loudspeakers are a small standmount costing £399 without stand and unusually at this price point sport a ribbon tweeter. Ian Ringstead puts them through their paces. 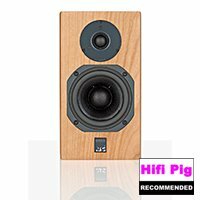 Scansonic is a newish brand to me that I have heard of, but had no experience of before now. 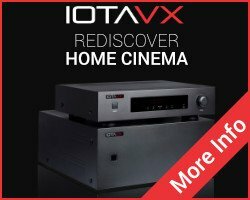 Dantax A/S was founded in 1971 with the aim of building high quality hifi loudspeakers the are the parent company of Raidho and the Scansonics are designed by Michael Børresen, creator of the Raidho range. Many things have changed since the start in the early 70’s – and today Dantax A/S has evolved into a competitive international company, offering a wide range of own “in-house”, Danish designed and developed hifi and home cinema loudspeakers, tabletop radios and hifi products under the Scansonic brand that matches consumers’ preferences with regard to modern functional design, quality and attractive pricing. If you look at their website you’ll see how big they are. 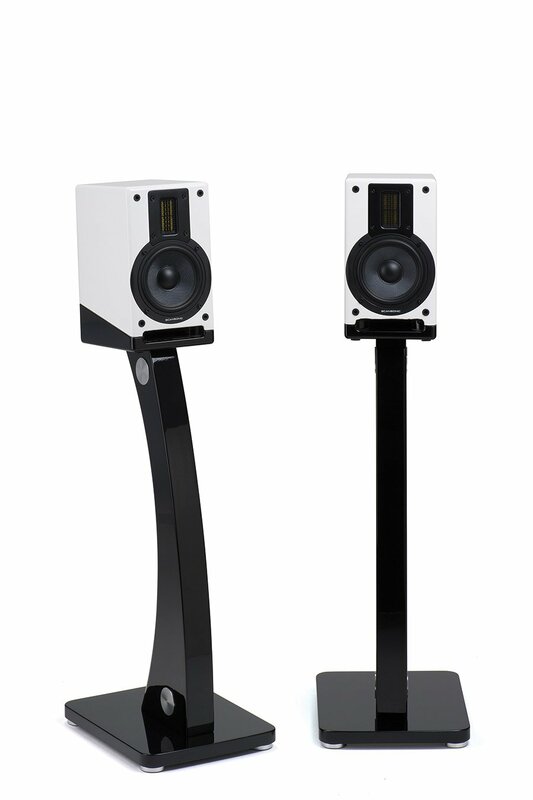 The M-5 speaker is a compact, two-way, stand-mount mini-monitor. The speaker is designed around an ultra light ribbon planar tweeter and a paper-polypropylene compound bass-midrange driver membrane. The speaker is crossed over at 3.5 KHz with a second order filter. They come finished in either piano black or piano white, I received the white finish with the floor stands in order to audition them properly. The finish is very smart and attractive and several friends commented on their appearance and neat size. 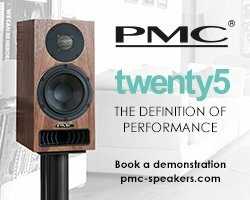 Being a small stand-mount/bookshelf speaker they fit easily into any environment and look very stylish on the matching curved floor stands which are designed to angle the speakers back slightly to provide the best sound presentation. The stands are flat packed so require building, and although not complicated they were a bit fiddly due to the nature of the design and brief instruction sheet. If you have built Ikea furniture before like myself (and plenty of it) then it is not difficult, just awkward. Once built the stands are very stylish and finished in the same piano black paint. 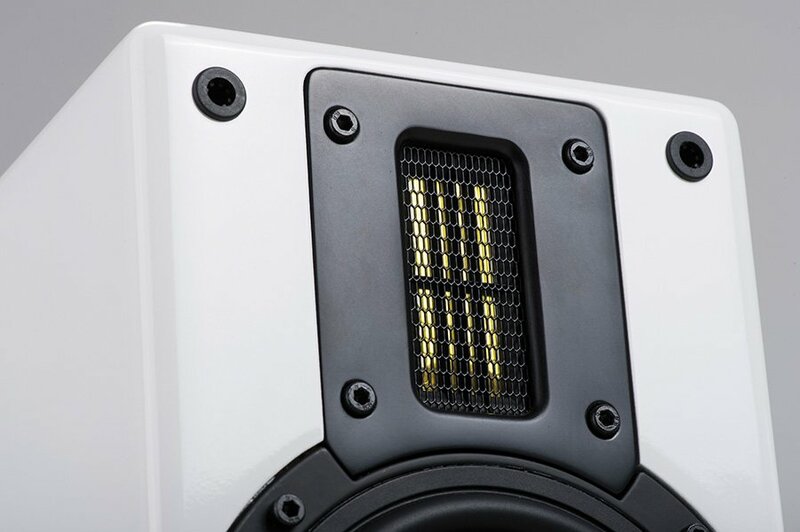 The speakers sit on top of the stands held in place by a bolt that screws into their base. Because all the fixings are hidden (to aid the stylish appearance) this is where the fiddly assembly comes in. The stands aren’t spiked but come with screw on feet to complete the neat appearance and allow for practical placement on floors. Scansonic also supply wall mounting brackets if you wish to hang them on a wall, but obviously they perform at their best stand-mounted in free space. The M-5 are single wired so no messing about with bi wire cables and I hooked them up with my Van Damme and also the superb Way Silver 2 cables to really see what they could produce. For such a compact speaker, once run in, I felt they were pretty amazing. 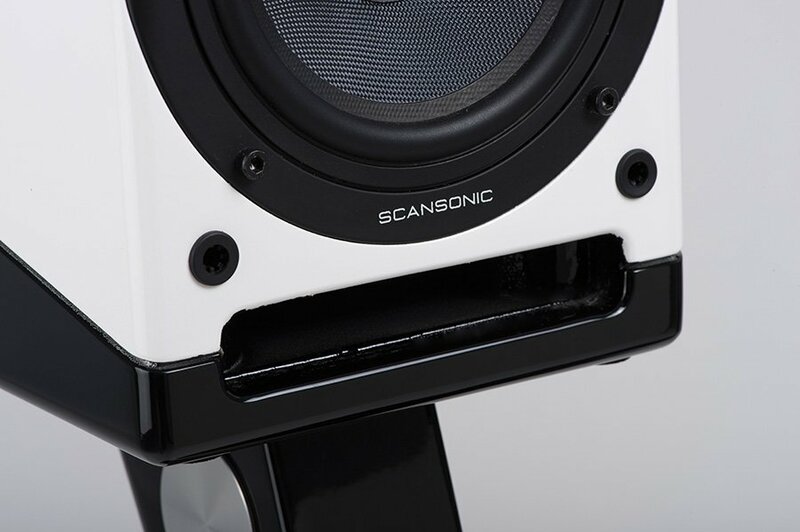 They are front ported with a slot running along the bottom edge of the cabinet to aid bass output and efficiency. 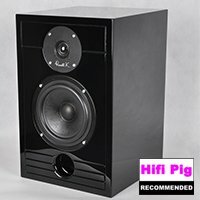 The bass they produced, although limited, was fantastic given their constraints and I marvel at how modern speaker design and materials now contribute to some astounding smaller speakers. I have reviewed quite a few compact designs in the last year and all have impressed me. Harking back to the eighties when I started in retailing, compact speakers had definite limitations that modern designs just shrug off now. 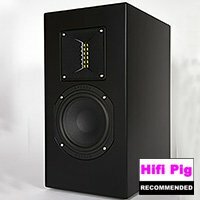 Not only was the bass performance pretty amazing, it was the treble that I felt was the pinnacle of this speaker’s prowess. The ultra light weight ribbon tweeter design is amazing for the modest cost of this speaker (£399). Ribbons have traditionally been expensive to manufacture due to their complex design and usually have only been incorporated in more expensive models where the cost constraints allow. Well miraculously Scansonic have obviously cracked the cost issue in order to use it in the M-5 and boy does it show. I generally like soft dome silk tweeter designs as I feel they give a smoother treble that metal dome tweeters don’t to my ear, but here this ribbon tweeter proves that a light weight foil design can conquer. The detail in all the recordings I played, whether vinyl or CD, was fabulous. Percussion, bells, cymbals, you name it soared and the detailing was so lifelike that I had no problem hearing everything with crystal clarity. Live recordings from Capercaille were stunning because the complex rhythms of the band’s instruments were beautifully reproduced and Karen Matheson’s angelic voice was superb and clearly portrayed. Scansonic recommend high quality amps of 50 watts or more and I can concur this. My Meridian 556 rated at 170 watts loved these speakers and drove them to high levels with no distortion issues at all. They can certainly rock, but they also liked all forms of music and classical was reproduced equally well, with the sound stage being really open and detailed. Now I am not saying these speakers are perfect, nothing is, but for the money I think they are superb. Compared to electrostatic designs like Quad and Martin Logan which are considerably more expensive, I feel the M-5 gives an insight into that type of sound with its lovely open presentation. Scansonic do floor standing versions higher up the range which I heard briefly at one of last year’s shows and they sounded very good there as well. They have the obvious bass extension the M-5 can’t reproduce but that’s for another time if I get the chance to audition them. 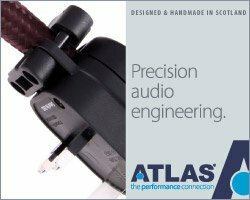 As a large successful manufacturer Scansonic’s expertise and economies of scale allow them to produce a really great value for money product range. The M-5 is the baby in the HD series and having seen and heard the results it can only get better. 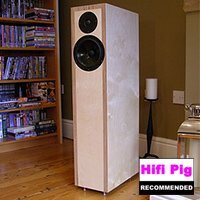 Stands are fiddly to build if you choose to buy them, but compliment the speakers well.